Isn't this beautiful? 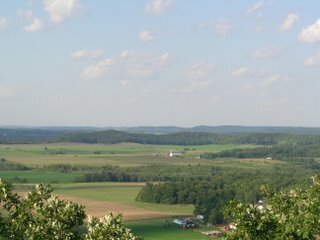 This shot is from the highest point in Dunn County, a tower built by the Seabees, on a hill at a local park. I decided to make a list of places I wanted to see in the area, hikes, parks, historic places etc. There are apples to pick and fairs to attend. I'm taking advantage of a summer at home. Gordy and Bear tell me that as our jobs settle into position, so will our travel time increase. Today I am going to the Dunn County Fair in Menomonie. I am told that it's lots of fun. I'm meeting some friends and we're going together. Tomorrow, I am hoping that a dinner party works out with my neighbors. I'm waiting for a confirmation from both of them. If you're praying, pray that all of us get along well and that the one single lady is really comfortable with everyone. Thanks! As for prayer, I am hoping to hear back from a bunch of contacts as to what short term missions are available for 2007. I know that stuff like this gets put on the backburner. If they don't email me back, I've got to start calling. Some of these guys are international. That will be like, midnight calls with long weird phone numbers! :-0 Besides, we need info for our churches that are planning for next year! I have to say, it has been fun. Feels good to have something signifiant to do toward missions after Thailand! Jim Elliot said.."Wherever you are, be ALL THERE!"